Create visuals that make studying for IB classes much easier. Using the Groups tool, you can share the IB Mind Maps you create with everyone you know. Access your IB Mind Maps anywhere at anytime, on your computer, tablet, or smartphone. Writing your extended essay can be a tedious process. Considering you have lots of other things going on in your IB classes at the same time, you could use some help keeping your thoughts organized. Mind Maps are the perfect way to lay out information regarding any subject, especially when you are being expected to understand how each aspect relates to another. Using IB Mind Maps as a tool for learning is a sure way to help organize your thoughts. Use ExamTime’s Mind Maps to outline your extended essay, or simply to clarify information in one of your classes. The Mind Map tool is simple to use, and allows you to creatively express and keep track of all the important information you receive in your IB classes. ExamTime’s Mind Maps allow you to attach Notes, Flashcards, Slides or Quizzes to a node, to provide more knowledge and aid in your learning. 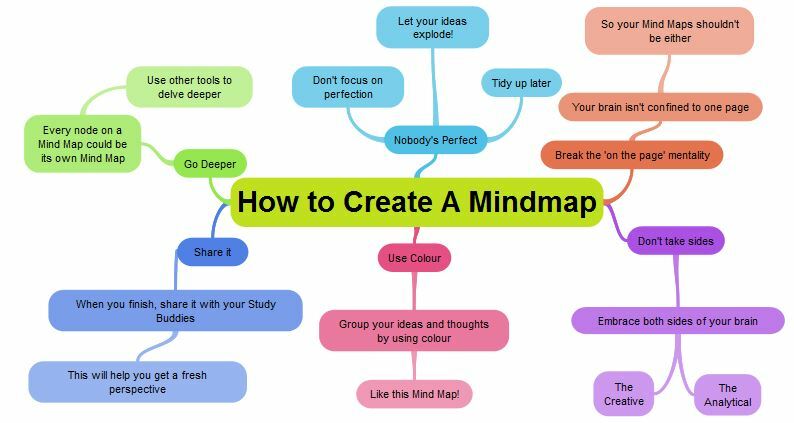 Get started making your own Mind Maps here, or take a second to look at some tips for making your first IB Mind Map in the photo seen to the right.